Masgouf (Arabic: مسگوف) is a traditional Iraqi dish. It is an open cut fish grilled and spiced with salt, pepper and tamarind. While keeping the skin on, it is then brushed with olive oil. Left: Stuffed Masgouf ready for roasting in the oven. Traditional garnishes for masgouf include chopped onions and tomatoes, as well as the clay-oven flatbreads common to Iraq and much of the Middle East. After marinating the fish, it is then placed on wooden sticks and then barbecued for a long time usually taking between one and three hours depending on the size of the fish. It's often done on a large flame. 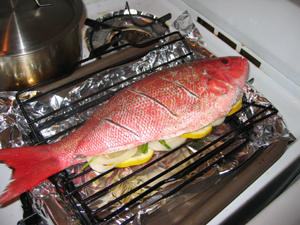 After the fish is well cooked and crispy, it is often sprinkled with the juice of a lemon, ready to be served. Like many other Iraqi dishes it is usually served with rice, along with salad and pickles.